Eric Staal was named MVP of the 2008 NHL All-Star Game, scoring a pair of goals and an assist. Marc Staal has known for years what the Carolina Hurricanes are learning this season. Whenever any situation presented itself to the Staal brothers back on the sod farm in Thunder Bay, be it a disputed goal or questionable sportsmanship, Marc, Jordan and Jared all turned in one direction for guidance -- big brother Eric. "Eric was always a lot more mature for his age than most people," Marc, the Rangers' rookie defenseman, said of his older brother. "He was always the adult of the situation. He always looked out for you, but he always acted older than he was." So it's no surprise to Marc that big brother is positioning himself to be the Hurricanes' next captain, as soon as Rod Brind'Amour decides the time is right to step aside or end a brilliant career. Eric Staal has never worn a "C" on his Hurricanes sweater, but the job appears to be tailor-made for him. He's a born leader and is now the best player on a team two years removed from its Stanley Cup, one that is positioned to win the Southeast Division this season. "Even when he was growing up, in school, and in anything, he was the guy that his friends or relatives would look at to see what was going on," Marc Staal said. "Usually you have one or two of those guys in a group that you look to, and he was definitely one of those guys." 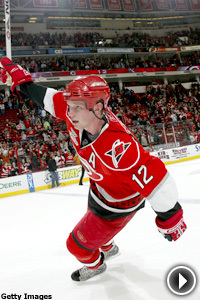 The Hurricanes knew all about Eric Staal's leadership when they drafted him with the second overall pick in the 2003 Entry Draft. They're seeing it in living color now with Brind'Amour sidelined with a knee injury. "We knew at some point he would be one of our leaders," Hurricanes GM Jim Rutherford said. "He was given an 'A' this year, which is the steppingstone. And, just in his own way, he's more comfortable now. He has a much bigger leadership role on the team, not only on, but off the ice. He's taken a big step." One of Eric's goals all along was to be the team's go-to leader, to wear the "C" on his shoulder. It's why he has kept a keen eye on Brind'Amour and former Hurricanes captain Ron Francis since debuting in the NHL in 2003. Eric said from Brind'Amour and Francis he has learned the various nuances of mental preparation such as "knowing there is a new day tomorrow, a new game," and how to "stay focused on the end result, and stay on track when things don't go your way." More importantly, Eric has come to understand that all of the leadership traits he sees in Brind'Amour and saw in Francis have forever been in him, too. They're part of his personality. They come naturally to him. "Growing up and being the oldest, I think you just get put into that role," Eric said. "I was the first one to go through things so I could give my brothers advice here and there. You want to be counted upon. You want to be looked up to." Marc said he and Jordan and Jared feel the same way about Eric as Eric feels about Brind'Amour and Francis. He was their mentor, their guide. They were lucky to have him. "He was drafted in the OHL (13th pick in 2000) when we barely knew what the OHL was," Marc said. "All of a sudden he was ranked No. 1 in North America, and our family and extended family were super excited for him, but he never changed a beat. He stayed the same guy and never let any of it get to him. "Eric paved the way for all of us," Marc continued. "He went through everything before me, Jordan or Jared now. It was just kind of like the second time through for me just because of watching him and being around him when he did it." Eric hasn't stopped paving the way -- or setting the bar high for his brothers. He was an OHL All-Star by 2002, and was a CHL First-Team All-Star in 2003, the same year he was drafted by the Hurricanes. Later that fall he debuted as professional against the Florida Panthers on Oct. 9, just 20 days before his 19th birthday. Eric finished his rookie season with 31 points. He missed only one game. Since the lockout, he's been one of the most decorated players in the NHL, complete with 108 goals, 129 assists, a Stanley Cup ring from 2005 and an All-Star Game MVP from this past January. "I always knew he was one of those kinds of guys in the mix with a (Vinny) Lecavalier," former Ottawa coach John Paddock said. "I think his speed and size (6-foot-4) are some of the characteristics everybody wants. And, he can obviously score. He has the total package." "He just knows where to go on the ice," added Boston Bruins center Marc Savard. "It's a pretty simple game for him. He skates well, he's a hard forechecker, and he loves the game. That's a tough combination to beat." To further demonstrate his leadership, that one game Staal missed as a rookie -- March 19, 2004 at Pittsburgh with a torso injury -- remains the only game he's missed in his career to date. That's a streak of 267 straight games; 292 when you include his 25 playoff games. "I want to do a lot more than I already have," Staal said. "More Stanley Cups, and making sure we're in the playoffs every year. I want to be a great player in this League for a long time. I want to do a lot of great things." "He'll be a captain at some point," Rutherford said. Marc, Jordan and Jared already knew that.